If you are looking to take your party or event to the next level you will want to try our Carnival Ride Rentals! Our carnival ride rentals will thrill and excite guests of all ages. Add Carnival Rides for extreme Fun! Guests of all ages will be entertained with carnival ride rentals from Deborah’s Party Rentals. They are extremely popular and so much fun! 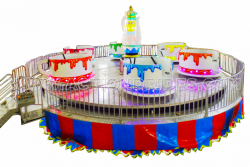 We have some traditional carnival ride Rentals like the carousel, tubs of fun, the Mindwinder, Orbit ride, Pirate ship, swings, train, race car ride and the twin spin that will thrill your younger guests and family members. The Froghopper-This ride takes the riders up a tower and then descends in a bouncing motion, such as a frog hopping. This ride is so much fun! The Human Somersault-Guests will love being spun around head over heals, upside down and all around. This ride is sure to thrill your guests! 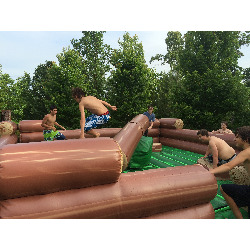 Log Slammer-Looking for a fast paced activity for teens and young adults, then consider the Log slammer. Guests will get to show off their speed, reactions, balance and stamina as they have to jump or duck to avoid the foam log. This game keeps everybody laughing, especially the spectators. 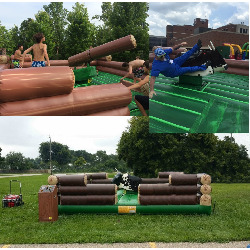 Mechanical Bull-Admit it, haven’t you always wanted to ride a mechanical bull? So have your guests. People of all ages enjoy trying to stay atop a mechanical bull as it tries and tries to buck them off. Imagine the fun and the incredible pictures of your event! Mechanical Surfer-Guests of all ages will try to show off their talents by staying on the surfboard and avoiding being thrown into the ocean. This is a fan favorite! 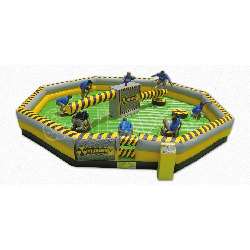 The Meltdown-One of our most popular rentals, the meltdown is an action game that tests balance, agility and reactions. Two spinning booms will challenge your guests in a super fun, interactive way. Your guests will love it! Rock Wall-Another one of our most popular items, the rock wall is extreme fun. Guests of all ages will be amazed and challenged. If you are looking for something to wow your guests, you’ll want to try the rock wall. Contact us-we can help you plan the perfect event! 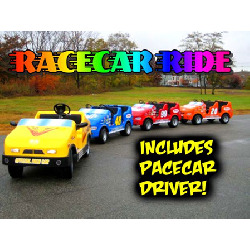 Rides are perfect entertainment for parties, corporate events, school events, church outings, carnivals and many more events. 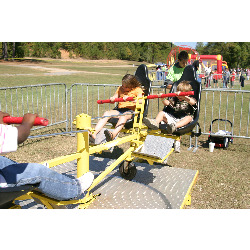 If you live in or near Birmingham, Alabama and are having an event and are looking for something to keep your guests entertained for hours, you will love our carnival ride rentals. We also have a large selection of midway carnival games, carnival concessions and tents, as well as a variety of other party rental items to make your event awesome. Give one of our event specialists a call today at (205)631-2670 | 1-800-651-2670.